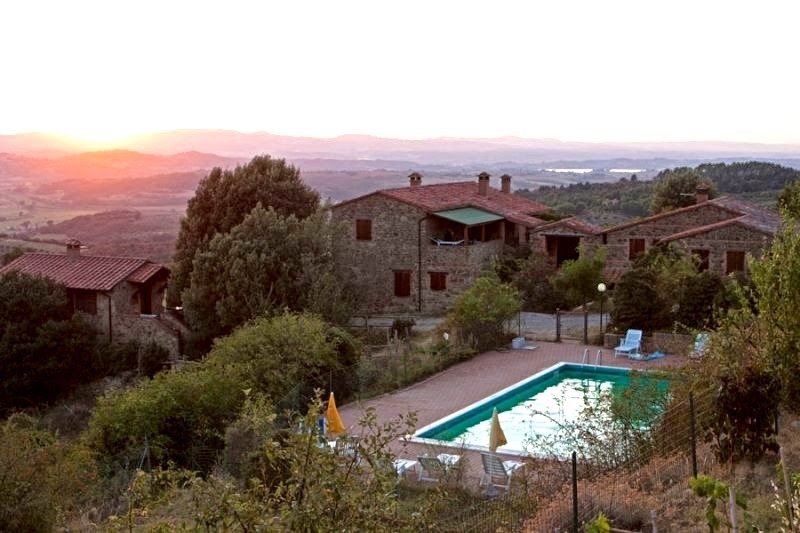 Farmhouse Paradiso Selvaggio is located just 3 km from the center of Paciano, in the natural park of Monte Pausillo (about 700 m above sea level), and therefore enjoys a beautiful view of Lake Trasimeno and the hills that surround it. It composed of 6 comfortable apartments (three rooms, apartments and a studio), made ​​in stone cottages completely renovated, furnished and all independent of one another, with a kitchen, fireplace and central heating. The rooftop swimming pool (6×12 me h. 1.45 m) is for the exclusive use of the guests, equipped with umbrellas and deck chairs in the large edge. Besides the swimming pool, it is available to guests also a fitness trail 3 km and a children ‘s playground . Secluded property just 3 km from the center of Paciano. … why choose our farm? Because you are looking for a warm and inviting atmosphere.